Meet Karim Virani, founder of Virani Real Estate Advisors based in Vancouver, BC. Karim’s warm, friendly demeanor is the first thing you will notice when you meet him. A Realtor since 1988, Karim’s passion for the real estate industry has garnered him many awards, consistently ranking top 1% of all Realtors in Greater Vancouver, and top 100 Realtors in Canada. Karim and his team at Virani Real Estate Advisors are passionate about giving back and having an impact, leading them to become World Housing’s very first realtor brokerage partner in Canada. Every home sold by Virani Real Estate unlocks a donation to World Housing, with a goal to build a neighbourhood in the Steung Meanchey slum in Cambodia in 2017. If you would like to support Virani reach their goal, make a donation on their fundraising page here! How did you hear about World Housing? World Housing has been on our personal radar for years. Pete Dupuis and Sid Landolt are both inspirational people who have been a part of Vancouver and my life for years. Their hard work and generosity of spirit is a solid reminder that children—wherever they live—deserve a place to play, in a community surrounded by family. That’s just one reason why Virani Real Estate Advisors got involved with World Housing. It’s easy to take the basic necessities we enjoy for granted, and we wanted to make a difference. Through Westbank’s Vancouver House, we gifted 13 World Housing homes to 65 people in need. Since then we have committed to providing a community with a neighbourhood and a playground and hope to continue to provide homes to families in need for years to come. To me, giving back to the community and the world isn’t just important, it’s a responsibility. Why did you decide to align Virani Real Estate Advisors with World Housing? We believe not just in dreaming big but in making those dreams come to life. 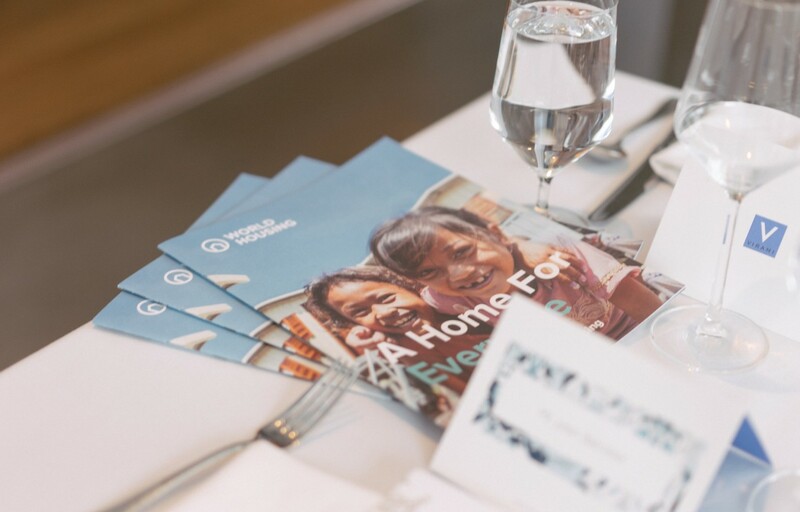 In many respects, World Housing’s vision to provide homes to families in need parallels our vision of pairing people with the homes of their dreams. We are a very fortunate society and we owe it to our brothers and sisters around the world to help each other when we can. World Housing’s one-to-one real estate gifting model is one of the best ways to give back to the developing world. It also partners with amazing organizations within developing countries to build community. These homes go to individuals who will take a leadership position and who have the initiative to better their community. What is critical too, is that these partner organizations work with people and families directly and teach them to be self-sustaining. That also resonates deeply with our belief systems as the best way to help people in need. A home is a gathering place. It’s where individuals, families and friends can flourish, whether finding solitude or sharing. It’s a place where people can unwind, entertain, learn, and love. It is an environment where individuals should feel safe and protected. It’s also a basic human need. Everyone should have access to a home, and we are in the business of providing these spaces for people. We’re not in the real-estate business – we’re in the experience business. We can bring meaningful change to people and families and enhance the quality and direction of their lives. Has the meaning of a home changed for you through out your career selling real estate? As lives evolve and change, the meaning of home does as well. There have been many ups and downs within my career, and throughout this time my home has been a haven for me. I have also seen this with the clients I represent. No matter what happens in life, people need a home. The security of that is something we often take for granted and I love being a part of the process of finding that for individuals. What is the most meaningful home you ever sold? Why? I don’t have a particular home sale that is more meaningful than another. Each and every sale has been an opportunity for me to find a family their dream home, a builder their dream lot or a to help an investor grow their portfolio. To me, a home is about balance: comfort and practicality. Due to the nature of my work, I have to be able to find a space that accommodates to my specific needs. Many nights I am working late so a home to me has to offer an environment where I can stay focused but also can unwind when I have a free moment. Location is something I also value. Vancouver is the most beautiful city in the world and looking out and seeing the city I love so much brings me joy. What role do you think philanthropy plays in real estate? To me, giving back to the community and the world isn’t just important, it’s a responsibility. In our field, we have the ability to provide homes for people who can afford to buy them. This is not the case for the majority of the world, and if there is a way to help families in need wherever they are in the world, we should be doing it. What are your client’s reaction to your involvement with World Housing? Many of our clients are excited to get involved in World Housing. With so many amazing organizations helping people around the world, it can sometimes be overwhelming finding one that connects with you individually. World Housing stands out because it does not just provide homes for families in developing nations, it provides a community full of leaders. Their influence radiates to other communities, ensuring that even after organizations step out, the community will continue to flourish. To World Housing, it is more than just providing a home to those in need, it is about teaching valuable life skills and educating individuals to lead a community. What message do you have for other realtors that are considering giving back? I urge everyone – not just realtors – to give back to the world and our community. We are in a privileged position where we can help, and we have a moral calling where we should help people who are less fortunate. Giving back doesn’t necessarily have to be in a monetary sense either. Even smaller gestures add up. It can be volunteering once a month, smiling at strangers, just spreading positivity around. We are all fighting our own battles, and it is important to stay grounded and realize all of us are essentially the same. We all deserve the same opportunities regardless of where we live. This is why World Housing is one of the best organizations to support – they provide opportunities for people to embrace their lives. To learn more about Virani Real Estate, visit their website.